China is the world’s largest importer of homopolymer, with volume in 2015 of 3.4 million tons, down 6% from 2014. This decline, however, was offset by higher imports into other markets in the region, noting especially India (526 K tons, up 21%), Vietnam (511 K tons, up 34%), and Malaysia (478 K tons, up 22%). 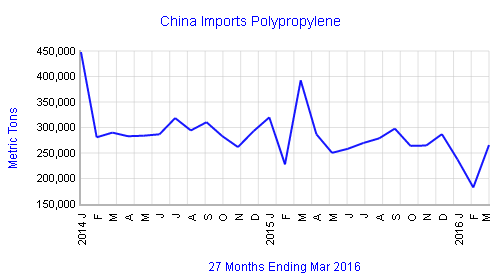 While importing less, China exported more polypropylene but volume totaled only 166 K tons for the year, up 32%. China’s imports through March 2016 of 685,100 tons were down 27% from first quarter 2015, noting a particularly weak rebound in March from the holiday-related slowdown in February. Imports from Saudi Arabia were cut by nearly 50%; imports from other sources also fell. Increased demand in Western Europe in 2015 was indicated by a 21% jump in imports, a 2% expansion in intra-regional trade and a 2% rise also in exports. Imports totaled 1.1 million tons, with the Middle East supplying 0.5 million tons, up 17%, Eastern Europe, 0.4 million tons, up 41%, and Asia-Pacific, 0.1 million tons, up 10%. Preliminary data for 2016 indicates an increase in imports into the region from the Middle East, Eastern Europe, Asia-Pacific and also Latin America. 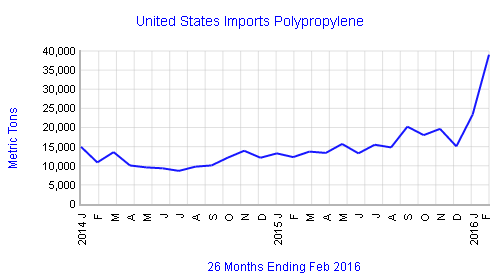 Evidencing tight supplies, US imports of polypropylene reached new highs in the second half of the 2015 and totaled 185,000 tons for the year, up 37%. Polymer was sourced from Canada, Korea, Israel, Mexico, Colombia and many others. Sharply higher volumes were imported in both January and February 2016, volume to date up 145%, to 62,000 tons. US exports trended lower nearly every month since July 2015. Shipments ended 2015 unchanged from the prior year, at 982,000 tons. 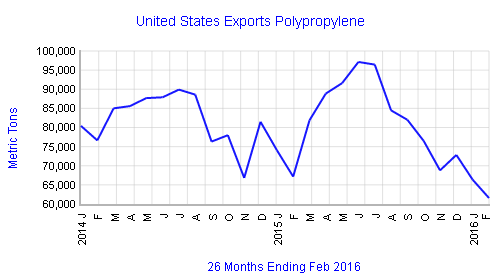 Exports in February 2016 sank to their lowest level in several years, volume to date down 9%, to 128,000 tons.